I've never made Swedish pancakes before or eaten them before but I thought these were very good. After I made a few I got the hang of it. I think they just need to cook longer than you'd expect for something so thin. They didn't seem to burn easily so I left them cook on the first side until they were very easy to turn. 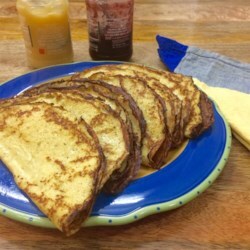 I'll probably make these again soon because they are a nice change from regular pancakes. Great recipe!